Noel’s family owned several colonial buildings on Jellicoe Street and Noeline chose the former shoe repair shop. 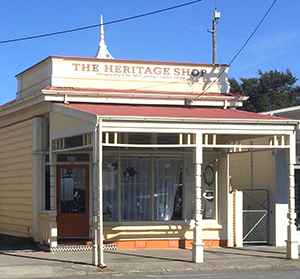 It has since been demolished but you can still see its twin, The Heritage Shop at No.35. It needed a major renovation but luckily Noeline had married a builder and Noel did all the work himself. She opened the business in 1964 under the name Coffeerama. It was a team effort with the children working there too. It was explained to them that the cafe would be helping the family and that in turn would help them. Noeline is not sure they found that argument as convincing as their parents did! She is sure it taught them useful life skills though. Most of her clientele were travellers – visitors to the area, salesmen doing their rounds, farmers in town for the day. People in the 1960s did not routinely go out for a cuppa or a coffee. They felt they could do a perfectly good job of it at home. The café also had a supporting role in the TV series Pukemanu which was filmed around the south Wairarapa. It was taken over by the film company and used to prepare the food for cast and crew. (you can check this old NZ TV series out at https://www.nzonscreen.com/title/pukemanu/series). Coffeerama closed in1970 when The Power Board acquired the land and buildings for their depot. Noeline’s turning 90 this year and she’s never swung a golf club, owned a poodle (with or without a string), nor had another baby but she does have fond memories of the café and the customers who visited it.